I get asked about undesirable puppy behaviors constantly. Every day I answer the same questions multiple times. This leads me to the conclusion that to call this more than just a “common” issue. Listen, I’ve never sugar coated anything before, so this is most certainly not the topic for me to start, not that it even was a consideration. Put your ego aside and you will be rewarded with knowledge, a happier puppy, and less damaged couch pillows. 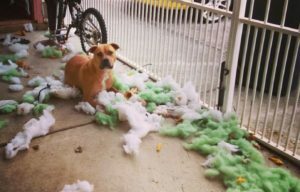 When you leave your pup alone, they tear stuff up, literally and figuratively. The reason why they do this stuff when you leave them alone is quite simple to understand. It happens because you left them alone. Why people continually think a puppy magically understands all the rules of a house is beyond me. Especially when the humans themselves haven’t decided what all the rules of the house are! A puppy left unattended in your living room will quickly be overwhelmed by the amount of stimulation. Not only does this create stress in the puppy, but it is setting the already stressed puppy up for failure. If you love your puppy, why on earth would you set them up for failure rather than success? One of the biggest mistakes people make with their puppies and new dogs is giving them far too much freedom. The dog must earn access to the home, not given the key on the first day! So it’s not just about the fact that the pup or dog is “alone” its the fact that they simply haven’t earned the privilege of being all over the house. Utilizing a crate or an exercise pen or play pen is key here. When you can’t interact with the pup directly they shouldn’t be left unattended. It is not complicated. It is painfully simple. Which is more abusive? You setting them up for failure so they can experience your anger and frustration and have no clue why? Or putting them in a safe place, with appropriate chew items, where they can relax and occupy themselves until you can give them your attention again? That should be a very easy question to answer. If it isn’t re-think your choice on owning a dog. Exercise and training games are my go to prescriptions for most any issue that a pet dog owner has with their puppy or adult. There are a wide variety of issues that people experience with a variety of solutions, but exercise and training go a long way to solving many issues. The reason behind this is that puppies and dogs have way more natural energy than most people realize. The smaller the breed, the more energy they will probably have. While this is a generalization and there are always exceptions, for the most part it holds true. A mastiff puppy will be far less obnoxious than a Rat Terrier. Keeping Einstein’s quote in mind, lets think about your puppy. If you puppy has energy, and you fail to drain it during exercise, play, and training, where do you think that energy will go? I can assure you, it won’t go away. By leaving the puppy in the already overwhelming environment of the living room, without supervision and a full tank of fuel, you WILL end up with a fire. The energy that is all bottled up inside is going to come out one way or another. You can direct that energy through games and training if you so choose, or the puppy can find an outlet for it. I promise you this, the puppy’s choice will not make you happy. Yes, you must become an energy draining monster. Well, maybe not a monster, but you better do your best to drain your pup’s energy! 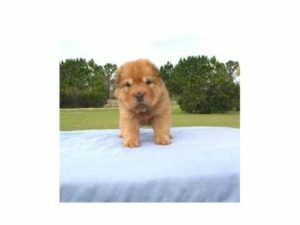 Whether dog or puppy, one of your most important jobs as owner is to fulfill their stimulation requirements. That means physical AND mental. Every single day you should be setting time aside to engage in meaningful games that focus on teaching desired behaviors. How else is the dog supposed to learn? This time strengthens your bond as well as drains their mental energy. Even going for a walk can be an exercise in focus and engagement. A dog who must obey the rules of a walk as established by the owner is a dog who is thinking as much as they are walking. What games do you play with your dog? There tons of activities out there that require practice at home. Dog sports based on running and chasing things, obedience, and even activities that require the dog to find things with their nose are all readily available. Getting involved in these activities means practicing at home regularly. Yet again, another fun way to drain your dog’s energy. Remember, it’s all your fault. So do something about it. 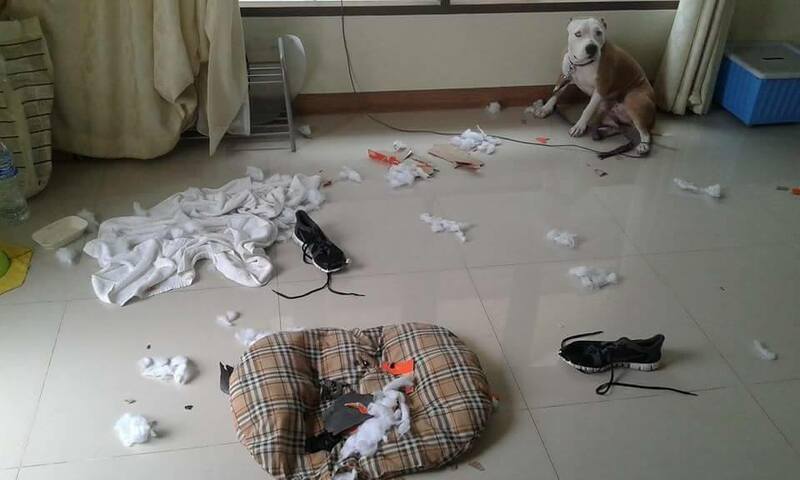 Whatever you do, when you walk into the house or a room and see a mess, DON’T YELL AT THE DOG!! If you feel the need to yell, go find a mirror and yell at what you see. What you should do now is plan on spending time with your dog training and exercising. In reality this shouldn’t be seen as a remedy to a problem, it should be seen as the reason why you have a dog in the first place. If not, then get a cat.